"The lifting of the California ban against selling foie gras (the hyperfattened liver of geese or ducks, brought about by overfeeding the live animals) is pretty much a nonissue, except to point out that as a nation we have little perspective on animal welfare. To single out the tiniest fraction of meat production and label it 'cruel' is to miss the big picture, and the big picture is this: Almost all meat production in the United States is cruel." He then goes on to show how the consumption of foie gras is rather low compared to the consumption of other animals and animal products. Bittman's Dictum: "Foie gras itself just isn't that important." Mr. Bittman concludes his essay noting, "Foie gras itself just isn't that important." Tell that to the magnificent ducks and geese who have large quantities of food mercilessly shoved down their throat to fatten them up before they're killed - see, for example, this video and also "Duck Mullard's story" (WARNING: Graphic content). Surely, they suffer more than cows and other "food animals" who are raised in loving "cruelty-free" environments and then killed. And, should we ignore the fact that dogs, for example, are used in horrifically invasive research, because far fewer dogs are used than rodents or other standard "lab animals?" Of course not. Frankly, I was very surprised to read this essay and the somewhat casual dismissal of the dismal lives of the magnificent animals who are used to produce foie gras. Just because "Almost all meat production in the United States is cruel" does not mean that force-feeding animals is not cruel or necessarily less cruel, and indeed, this is an integral part of the big picture of food production; it does not "miss the big picture" at all. Mr. Bittman's dictum should be soundly rejected, especially, perhaps, from the animals' point of view. Furthermore, just because foie gras is statistically insignificant and "itself just isn't that important" according to Mr. Bittman, this does not mean we should not be extremely concerned with the utterly cruel ways in which it is produced and the lifting of the California ban. We must be concerned with the well-being of every single individual who, or animal product that, winds up in our mouth. I'm sure the sentient geese or ducks who are used to produce a thoroughly non-essential pricey delicacy, the victims of savage gavage - force-feeding against their will - don't feel it's a non-issue. And, because they will eat just about anything, does not mean they like having food violently shoved down their throat. 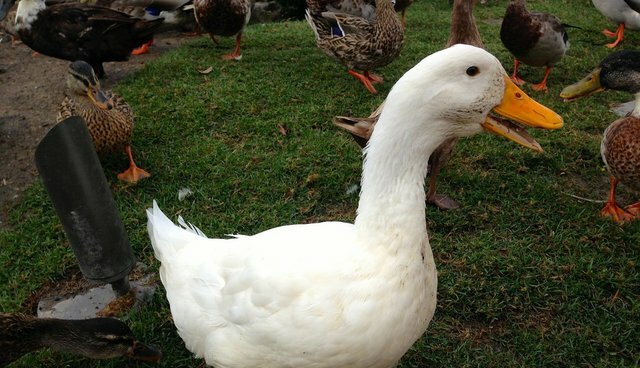 It is essential to work hard to reinstate the ban against foie gras because the life of every single individual counts. We must protect each and every one of the hapless victims of our gluttonous ways.